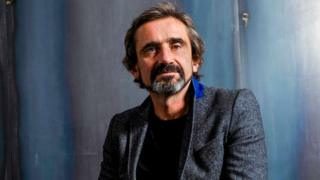 Superdry executives, including the chairman and chief executive, have resigned after founder Julian Dunkerton won his bid to be reinstated to the board of the company he founded. In a narrow victory on Tuesday, Mr Dunkerton won the support of 51.15% of shareholders who voted. After an emergency board meeting eight directors resigned en masse. Mr Dunkerton, who left the chain a year ago, has been appointed interim chief executive. He has blamed management for flagging sales and profits and has promised to revive the firm's performance. Superdry's board had threatened to resign if Mr Dunkerton won the vote. The chain's chairman, Peter Bamford, chief executive Euan Sutherland, chief financial officer Ed Barker, and remuneration committee chair Penny Hughes, resigned from the board "and will stand down with immediate effect" the firm said in a statement to the markets. Dennis Millard, Minnow Powell, Sarah Wood and John Smith have given three months notice and will stand down as directors on 1 July. Two board members remain: company secretary Simon Callander, and non-executive director John Smith. UBS and Investec also resigned as Superdry financial advisers on Tuesday. Peter Williams has been appointed as board chairman. Mr Bamford had earlier said the board would hold an emergency meeting this afternoon. "Whilst the board was unanimous in its view that the resolutions should be rejected and 74% of shareholders other than Julian and James have voted against, there was a narrow overall majority in favour and we accept that outcome," he added. Mr Dunkerton had said he was "delighted" by the outcome of the vote. "We have a wonderful opportunity to take this brand and this business to the next, exciting phase of its growth and development. "I can't wait to get started and to work with the directors, the talented staff and our partners to deliver the future of Superdry. The hard work starts now." The fashion chain had urged investors to reject Mr Dunkerton's return, saying it would be "extremely damaging". In a separate motion proposed by Mr Dunkerton, votes ahead of the meeting suggested a majority of shareholders (51.15%) were also in favour of the appointment of Peter Williams, chairman of online retailer Boohoo, as a non-executive director. The vote comes amid a long-running dispute over the clothing brand's strategy. Mr Dunkerton - who owns 18% of the company - was chief executive until 2014, when former Co-op chief executive Euan Sutherland took over the role. However, Mr Dunkerton remained at the company as creative director until he left a year ago. Since Mr Dunkerton's departure Superdry's shares have plunged by 65%, and he and Mr Sutherland argued over who is responsible for the brand's decline. The management had planned to branch out into childrenswear and was also trying to broaden its range away from the firm's roots of branded hoodies, jackets and T-shirts. In contrast, Mr Dunkerton had argued the brand should continue to focus on products that made it famous. He said venturing into childrenswear was a mistake, saying a 16-year-old "quite categorically" will not want to wear the same brand as their five-year-old brother. "Next steps will likely see the kidswear launch scrapped and a step up in new product innovation. We sense there will be some upfront costs and disruption before Julian's recovery plan starts to take shape," analysts at Peel Hunt said. Two big institutional shareholders - Investec and Schroders, which together control about 10% of the shares - backed Mr Dunkerton's return. But the company's second largest shareholder, Aberdeen Asset Management, sided with Superdry management, and influential investor advisory firms PIRC and Institutional Shareholder Services (ISS) had both recommended that shareholders should reject Mr Dunkerton's re-election.